Please welcome on Saturday, 20th July: LAZULI. LAZULI took the audience by storm when they performed in 2009, 2012 and 2015 at Night Of The Prog. We have also fulfilled many requests by fans and LAZULI are the last addition to our line-up 2019, which is now complete! Their most recent album is „Will“ from 2017 and this could be their most progressive work so far. The band has signed to GEP records just two years earlier. For their performance, they will focus on this album plus some stuff from earlier albums. ALL TRAPS ON EARTH confirmed! All Traps on Earth is a new Swedish prog band that will do the first ever live appearance at the Night or Prog Festival, 2019. Their first studio album, „A Drop of Light“, written by Johan Brand and Thomas Johnson (Änglagård), was released in late 2018 on AMS record. While the band was initially built for the studio, the overwhelming reception for „A Drop of Light“ inspired the creation of a live band, including old friends from the Änglagård days – Erik Hammarström, Jonas Endgegård, Linus Kåse, and Daniel Borgegård Älgå. The music of All Traps on Earth is deeply rooted in the progressive movement of the late 60s early 70s. It is powerful, full of the chaotic, the symphonic, the enchanting and the fragile. The landscapes are varied through instrumentations that includes wind instruments like the flute, saxophones of all sizes, clarinets, and walls of Mellotrons, alongside fuzz-guitar, Rhodes, Hammond organs. But it is the duo on bass and drums that steals the show! The band will perform tracks from their studio album A Drop Of Light – but maybe also something from Änglagård at the Loreley! Please welcome on Friday 19th July: CHANDELIER! Chandelier is a German Neo-Prog band, which released three critically acclaimed albums on InsideOut Music in the 90ies, before calling it a day by the end of the last century. Fast forward 20 years: The albums are now being re-released, and were remastered by Grobschnitt legend Eroc. After 25 years, CHANDELIER will be back on stage for one night only, performing material from the three albums that placed them at the forefront of the German prog scene in the early 90ies. This exclusive reunion concert will feature four members of the original line-up – which Progressive Rock Files called «one of Europe’s most accomplished neo-progressive rock bands» and the show will center around their album Facing Gravity, featured in Eclipsed Magazine’s list of Top 40 German Prog albums. 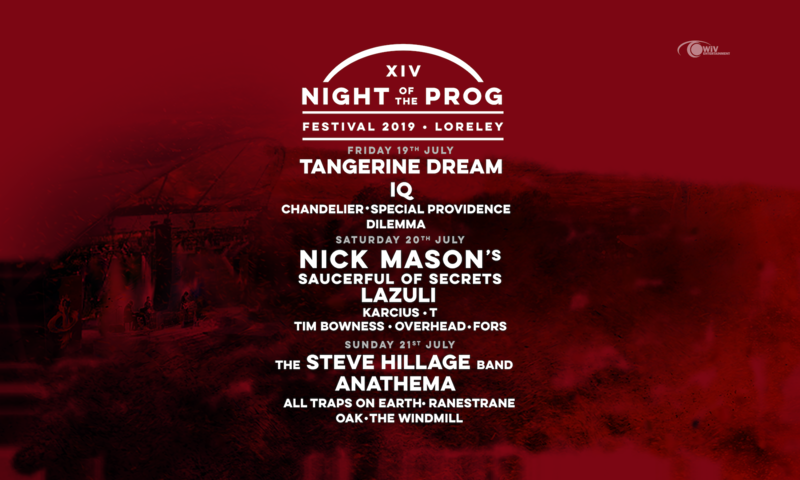 We are thrilled that Tim Bowness will be part of the Night Of The Prog Experience, so please welcome, for the first time on the rock: On Saturday – Tim Bowness! Anathema from Liverpool, UK and were formed back in the very early Nineties. The band has produced 11 albums so far. Their latest one, „The Optimist“, was released in 2017 and has received an astonishing feedback from both, fans and critics. After their wonderful performances in 2011 and 2014 and five years, welcome back on the rock: ANATHEMA!